There's a new complete edition deluxe book set in the works for Don's "Pertwillaby Papers" and "Captain Kentucky". Check the project page on Indiegogo to preorder your copies now! It is with deep sadness that we have to inform you that one of our friends and original D.U.C.K.hunt members, Geir J. Netland, has passed away on April 26, 2011, due to a heart failure. 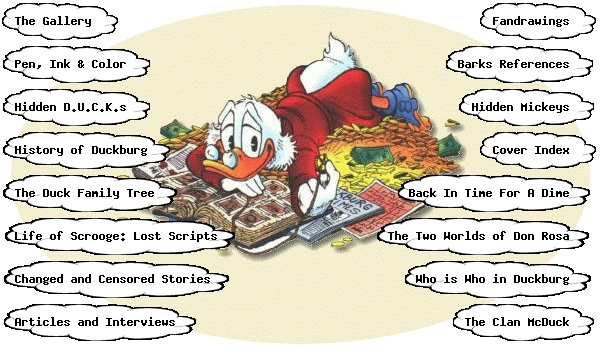 Geir established the "Unofficial Don Rosa Gallery" page that can still be found here. Our thoughts and prayers go out to his family and friends. All the comic images available from this page an all characters (like Scrooge Mc Duck, Donald Duck...) are © The Walt Disney Company. They are provided for purposes of study and reference. Disney's copyright is acknowledged and respected. Nothing shown on this page is meant as a Copyright Infringement. If someone has a good reason why a picture shouldn´t be (or should be) on this page please let me know! Thank you kindly! All requests, questions and complains should go to the webmaster!